Old forms of Finland’s place names (mainly Swedish) are written within square brackets [ ]. Ahead of me, 206 years away, goes a man, not very tall, looking wiry. I know that he is 42 but he looks elder. He is returning in a horse carriage with his companion from the rapids of Imatra via Lappeenranta [Wilmanstrand] to Viipuri [Wiburg]. Later I see him on the road which leads from Hamina [Fredrikshamn] to Porvoo [Borgå], walking toward Stockholm. He now has a bag in his back and a cane in his hand. His clothing is simple and his manner is refined. He is walking fast and easy, though he limps his left leg. First kilometre on the fully loaded bike went very well. Also the second. Perhaps this will succeed after all, even though it has been a long time since my preceding long bike voyages. I am no more young and my physical condition is what it is. Within the panniers and on the carrier I have among others a tent, a sleeping bag, a thin air mattress, extra clothes, some tools, camera, phone, a small cooker and food for about a week. It is roughly the same load that I have carried in a backpack on treks in Lapland. I rode the bicycle along the road from Punkaharju to Parikkala and from there to Imatra. The Punkaharju road is not very old, probably constructed in the 1950’s. The old gravel road to Viipuri winds in many places on both sides of the new road, but I like the new one because I believe that it will take the pedaller faster and more easily to his destination. After many pauses and over 80 kilometres of pedalling I was at the gate of Imatra Camping. At the reception there was a queue, because a man in broken English hoped to have a permission to make a campfire. I overheard that it was not allowed, if one is not lodging here. In the camping site I saw no other bikers. There was about a dozen tents in a small area, obviously all except me from across the eastern border, which is not far from Imatra. In a near-by tent a man was giggling aloud all evening until he passed out after midnight. In the morning I passed the tent of a Russian couple. I perhaps looked a little dumbfounded by the man’s callisthenics by the tent. He noticed my staring; later when I wheeled my bicycle toward the gate, he wished me a happy journey in English and I returned the greeting. Next I should have gone to look at the waterfalls of Imatra. Why? Therefore that the idea of this bike journey was, among others, to follow the route of German Johann Gottfried Seume across Southern Finland in the summer of 1805.
Who on earth was Johann Gottfried Seume? J. G. Seume started studies at the age of 17 at University of Leipzig in 1780, but on the following year on a journey to Paris he was seized by army recruiters and he had to serve in the British and German military services for several years. At last in 1787 he was free to continue in the University. After his studies he taught languages in Leipzig. After moving to Warsaw, Seume became secretary (with the rank of lieutenant) of a Russian general in Poland and experienced the horrors of the war in 1790’s, after which Poland ceased to exist as a state for more than a hundred years. He returned to Leipzig in 1796 to serve as printer’s proofreader. A few years later, in 1805, Seume made his second Grand Tour to Poland, the Baltic, Russia, Finland , Sweden and Denmark. Now he travelled mainly on horse cart but walked when required, for instance in Estonia 60 km in one day and from Viipuri via Sippola to Ahvenkoski and from Loviisa to Porvoo in Finland, some 250 km. The travel book (”Mein Sommer 1805”) was published next year but it was immediately banned in Souther Germany, Austria and Russia. The book obviously was in its time too critical against the authorities and especially the slavery in Russia and their effects on the social, political and economical conditions. “Mein Sommer 1805” was soon translated, a little abridged, in English and printed 1807 in London under the title “A Tour Through Part of Germany, Poland, Russia, Sweden, Denmark, &c. During the Summer of 1805”. In the years following these journeys Seume suffered from kidney and bladder illnesses and died only 47 years old in 1810. Seume is the least known of the many writers that visited Finland at the end of the 18th and the beginning of 19th century. Giuseppe Acerbi’s books of his travel to Lapland through Finland in 1799 has been published also in Finnish, as well as the book of Edward Daniel Clarke from the same year. Seume knew Acerbi’s book and comments on it in “Mein Sommer 1805”. Seume’s works have not been translated into Finnish and he is mentioned in Finnish literature only rarely. The gates of the Imatra rapids dam were opened daily for 20 minutes, but only in the evening. Waiting a whole day did not appeal to me and I started to pedal my bike toward west. – Later we drove by car from our villa in Punkaharju to see the rapids of Imatra. If the rapids are too tame for you, you can slide upside down above the white waters. The road from Imatra to Joutseno [Joutsenus] was being broadened and no one of sound mind would bike among the big machines and cars. 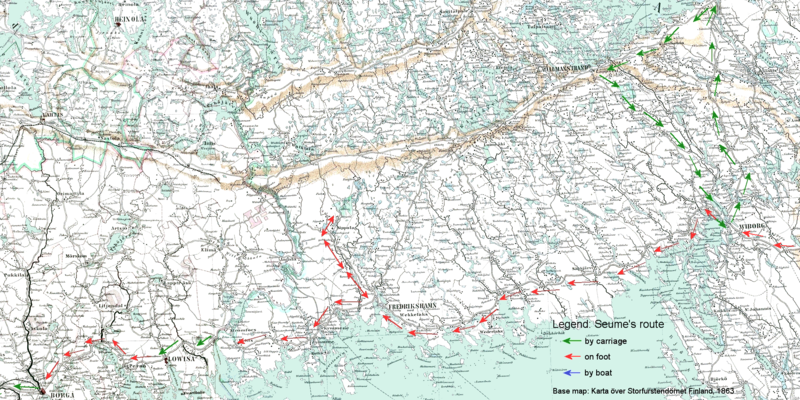 From a biking map I remembered that there should be a route recommended for bikers which led near the shores of Saimaa. Too bad that the biking map was not with me. I carried a good road atlas of Finland and a GPS with a very detailed road map but both were aimed at a car driver. Neither could not tell, where one could go with a bike and where not. Old route from Imatra to Lappeenranta may have gone here. I could get to Joutseno easily enough but it was quite another story to get out. There was a nice and straight biking lane leading from Joutseno to Lappeenranta [Willmanstrand] along the main road, but it seemed impossible to get onto it because of the roadworks. I found one road which might have led to the biking road, but that road ended up in the woods. Finally I found a parallel road on the other side of the main road and that took me to Lappeenranta. After Lappeenranta I and my imaginary fellow traveller went our separate ways for a while. In the winter I had tried to reconstruct Seume’s route from Lappeenranta to Sippola using 19th century maps. 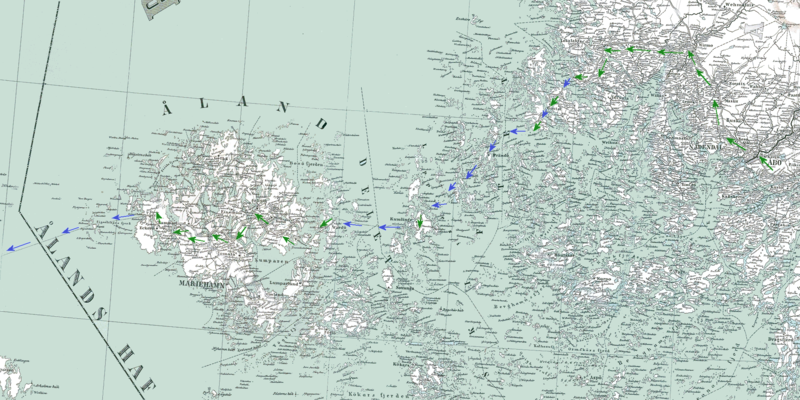 I thought that Seume had used the shortest route between Imatra and Sippola. If so, he should have first gone to Taavetti and then walk 25 kilometres along the Hamina road and then take a 20 kilometre path through the forests to Sippola. Another possibilities were to go from Lappeenranta to either Kaipiainen or Utti and then to Sippola; both seemed very unlikely to me. Only after my own trip I understood that he must have gone back from Imatra to Viipuri (“… and returned next day by Wilmanstrand”). It was then most natural that Seume walked to Sippola from Viipuri by the Great Coastal Road via Hamina. So I continued westward from Lappeenranta along the road 6. The separate biking road ended soon but the hard surfaced verge was broad enough for the bike. Wind was still against me as in the previous days but the big trucks passing my bike caused whirls which helped a little. Near the populated places there was again a separate lane for bikes and pedestrians, but its surface could have been better. In some places the bicycle road was quite new and broad for the benefit of the building sites at the near-by lake. A van at Luumäki is passing by a bunker of Salpalinja which was built during the last war. A breakfast table at the camping site, all to myself! I arrived at the camping site of Taavetti at around 19, but the door of the reception was locked. I then thought to drop by the reception in the morning and put my tent up near the shore where there also were a lot of camper vans and caravans. The site was very quiet (at least compared to last night in Imatra) but the shower room was really dirty. The bolt of bike’s standing rest was getting loose and I didn’t have a suitable tool to tighten it. Luckily a near- by service station had a suitable and cheap set on sale. When the bolt was tight, I took the key with me and left other keys there for someone in need to find. At home there were several similar sets and I needed no extra ballast for the road. After the morning coffee at the familiar bakery I went sightseeing in Taavetti. If Seume would have gone this way – which he did not – he would have had to go by the outer fortress which controlled the Taavetti crossroads. In 1805 the fortress was no more used but there still should have been tens of wooden buildings belonging to the garrison. The road from Taavetti to Hamina (which Seume would have used, but didn’t) was narrow and winding and used by heavy traffic of trucks transporting cars from Germany to Russia. Therefore I went on to Kaipiainen and from there south towards Sippola. Seume does not tell, how he ended up a guest at Sippola manor. 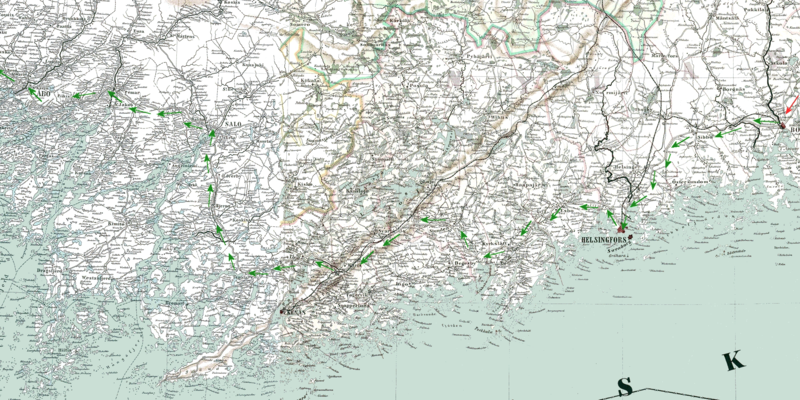 Just like today, in 1805 Sippola was off the main roads and nobody would go there by accident. In his ascetic journey Seume enjoyed Sippola and especially the “Mamurami” (’maamuurain’ in Finnish) or Arctic bramble, Rubus arcticus. The owner of the manor Johan Samuel von Daehn was inspector of schools in Viipuri province, and it is possible that Seume had had an advice to go to Sippola from the teacher of Viipuri gymnasium who had accommodated Seume for a few days. Another, perhaps more likely possibility is that Seume had met von Daehn somewhere, in Hamina [Fredrikshamn] for instance, and received invitation from him. Seume writes that in Sippola he could see four lakes from a point of a rock. Today two of the lakes are practically disappeared, thanks to draining. The main building of the Sippola estate was destroyed in fire but it was rebuilt on the same site in 1836. This road sign to yesterday (’eilinen’) in Sippola leads nowhere. There are no camping sites nor hostels between Kaipiainen and Hamina. Therefore I tried to find near the road a suitable place for putting up the tent. As I approached Hamina, more and more houses congested the roadsides but at last I found a suitable patch of forest and drove a small road leading into it. I started to look for a good site for my tent – in Finland no permission is needed for camping except in the immediate vicinity of somebody’s house. A few minutes later a SUV with two men inside drove to me. The younger one started to inquire my comings and goings and stated that “I happen to own this property”, as if I were going to camp in his courtyard, throw garbage everywhere and burn his pathetic trees in the bargain. After the car had driven away I walked with the bike a couple of hundred metres off the main road and pitched the tent on thick soft moss. The place was excellent but I did not sleep very well. I woke up before 6 in the morning and arrived around 8 to a coffee bar in the outskirts of Hamina. The tables were full of people going to work or whatever, in need of a cup in the morning. After the coffee I tried to play tourist, but it was too rainy for any kind of serious exploration. There is a good bicycle route from Hamina to Kotka and Karhula which mainly goes along an older road. The recurring showers of heavy rain persuaded me to wear my new waterproof cape which, to my disappointment, became as damp in the inside as my old cape. I was glad that I am not made of sugar. The bike is leaning to a sturdy standing rest. Near Karhula another long distance biker rode with me and we exchanged greetings and whatever came to mind of bikes and routes. He had spent the previous night not very far from the place I was. At a complicated crossing later on I asked another biker about the bicycle route to west. It came out that in the spring he had had an accident with a car and because of the compulsory break, his arse did not yet bear long bike trips. Of course I praised my own 40-year old narrow and rock-hard leather saddle which had never caused any troubles. Walls of the Kyminlinna [Kymengorod] fortress. Seume thought that its position was not the best possible because of a high rock from which the citadel could be annoyed in a case of an attack. Riding towards Pyhtää [Pyttis] I could pedal long distances on the Great Coastal Road which winds on both sides along the present highway 7. This road from Turku to Viipuri was used already in medieval times but as late as 19th century it was not very great, its width being only some 6 metres at best. Kymijoki [Kymen] was the border between Sweden and Russia 1743–1809, and therefore Seume had to cross the border at Ahvenkoski [Abborfors]. According to his account, there were two bridges leading to an island in the middle of Kymijoki. The northern bridge belonged to Russia and the southern one to Sweden. This seemed rather odd to me, because today the road crosses Kymijoki over a bridge that is oriented roughly from east to west, not north to south. An explanation started to take shape when I pedalled from the main road to a smaller road which took me to the southern end of Savukoski bridge which is no more in use. – O.K., I thought, Seume must have mixed up north with south. After my journey I studied the history of Ahvenkoski border crossing point and old maps and found out that Seume’s account had been perfectly correct. The dam of Ahvenkoski power plant had risen the water level here several metres in the 1920’s which altered the shores and roads completely. Savukoski bridge had been built in 1920’s to replace the old low lying bridges. In Seume’s times the Great Coastal Road was 1,5 km to the north of today’s main road and it led to the northern end of Kirmusaari in the middle of Kymijoki. On the Swedish side there was an impressive post house – which also served as border crossing – which had decayed in the 19th century when there was no use for it any more. In the 20th century the waters of Kymijoki rose near the ruins of its foundations. In the cloudy weather I continued from Ahvenkoski onwards. There were very small possibilities to put up a tent in the densely populated Finland’s south coast, so I just pedalled on. At Loviisa it rained, and I sat in the park under my cape. After a couple hours of pedalling and a couple more pauses I was at home in Porvoo. At Ilola [Illby] inn near Porvoo [Borgå] Seume had ”an execrable dinner and an excellent bed; balanced one against the other, all was well enough”. Somewhere after Porvoo Seume started to use carriages again, partly because it would expedite his journey and partly because it did not pay him more, rather less than when he walked. Additionally, the weather was hot and no doubt his feet did not like it. The inns in Finland in Seume’s eyes were neat but in general ”all that could be obtained from them was very sour beer, very coarse bread and very bad butter”. On the other hand, Seume praised the inn of Helsinki [Helsingfors] whose landlord spoke German. Seume had almost nothing but favourable things to say of the Swedish part of Finland where things were good and getting better. In the so called Old Finland or south eastern part of the country, nearly everything was bad and going worse under Russian rule. On the whole, Seume dedicated much of his narrative of his journey in Finland to drawing comparisons between Russia and other countries. Photo taken from the same place in 2011. There are more trees and most buildings have been replaced by new ones but the overall impression is the same. My pause in Porvoo prolonged to a couple of weeks during which I, among other things, went back to our villa to get my wife and our cat back to civilization. One Sunday I again mounted my bicycle. The old road which winds to Helsinki by way of Hinthaara and Nikkilä is narrow, winding and rolling, which my thighs did not like at all. There seemed to be quite a many bikers who pedalled with discouraging speed against the wind. Old road crosses Mustajoki (Black River) at Yli-Vekkoski. Train enthusiasts are delighted by this old commuter train which on summer Sundays drives along the Kerava – Porvoo railway which is not otherwise used. I did not try to find the Helsinki inn which accommodated Seume but followed the broad bicycle lane along the road 50. Thanks to the creatively turned signs, I might have finished up in Inari instead of Vantaankoski if I had not known these roads well. When the bicycle road then ended without warning at roadworks, I luckily had no difficulties in finding my way to Vantaankoski along the Great Coastal Road. With luck it is still possible to catch fish in Vantaankoski. In a balloon you might already be there? In the 18th century it was not officially allowed to use this part of the Great Coastal Road because the traders of Helsinki did not want the potential customers to go past the town without coming to their shops. In spite of the ban, the road was continually in use. The roads of Espoo are some kind of returning to my youth, because they were my regular biking routes in the 1970’s. The roads were where they used to be, but now I saw new houses everywhere in all possible and impossible places. The Bell house in Bemböle has been an inn since the 1760’s and is today known as Bembölen Kahvitupa (’Bemböle Coffee House’).A couple of kilometres to the north from the Coffee House is a camping site where I pitched my tent. As a kid I used to come to swim in the near-by Bodom lake and lie on the warm cliffs in the sun. In the camping site there were altogether 7 tents, which the girl in the reception regarded as rather much. On the other hand, there were tens of camper vans and caravans. Obviously the term ’camping’ means totally different from what it was a few decades ago. At night there was quite lot of rain and fresh winds that made the tent tremble. The road from Helsinki joins the Great Coastal Road at Bemböle in Espoo [Esbo], where there are several houses which have served as inns in various times. The passengers who had slept the night in Helsinki may have paused here but certainly continued their journey further off. One could travel at least 30–50 km a day with an inn’s horse carriage. Because the route and pauses were now determined by the man who drove the horse, Seume had very little opportunities to get acquainted with the places that he went by. Seume covered the 100 kilometres between Helsinki and Salo with two sentences: “At Svenskby I even met with a postillion who understood my native tongue, and had often been on board a ship to Reval. Near Mialbolsta, there are several very fine situations upon a lake, with some country-houses.” ’Svenskby’ is obviously Svenskby in Tenhola [Tenala] ja ’Mialbolsta’ is Meltola (Swedish ’Mjölbolsta’) in Karjaa [Karis]. In the morning I wondered, is there any sense in this, a man approaching 70 and driving a bike all over Finnish roads. What am I doing here anyway? After morning coffee at the atmospheric Kahvitupa I continued pedalling along the Great Coastal Road, or King’s Road, to the west. Or, well, according to the guideposts, it was the King’s Road but here at the centre of Espoo the streets were seldom at the same places as the old road. The things were different a little more to the west, where the environment resembled countryside and the old bridge from 18th century has remained in its place, though patched up with a lump of concrete. The region around Kirkkonummi and Porkkala was after the war leased to the peace loving neighbour country and used as a military base until 1956 to strengthen the friendship among nations, as the phrase was. The names of the streets remind now, where was the lease area’s border. After Kirkkonummi the road to Siuntio seemed to be in same place as the Great Coastal Road. These neighbourhoods were well known to me from my bike trips. I even participated in the 1976 Siuntio race in which I completed the 100 km distance in less than 4 hours with my 3-speed bike. Today 8 hours would probably be insufficient. In Siuntio the road turned from west to northwest but that did not weaken the adverse wind, because the westerly was gradually getting stronger. After the parish village of Siuntio, the Great Coastal Road turned again to west. The strong headwind felt quite excessive when the crosswind was difficult enough for a biker. I decided that it was not mandatory to go along the old road after Seume. Today I go north to Lohja and see tomorrow, whether the headwind is still annoying me. So I pedalled to Lohja where the bicycle lanes and signposts were as substandard as in any other backward village (actually Lohja is a medium sized town, but for some reason I don’t like it). In the centre, the bicycle lane ended abruptly to a sign with an arrow to the other side of the street. In the other side soon another sign had a crude command: Biker! Get off the pavement! Accordingly, I pedalled for a while among buses and heavy trucks, which have more regard to a biker than do the dogs and pedestrians on the pavement. The Haikari camping site in Lohja is mainly intended for caravans but also tents can be put up there. At the reception a friendly supervisor came to show me the place where to pitch the tent and recommended to choose a somewhat higher site, as the ground was still rather wet from preceding night’s rain. The water drops stayed outside the tent, as they should. Also the following night was rainy. In the morning I intended to go to west after Seume’s carriage tracks but then I changed my mind. When I departed, there were some people at the camping site gate who waved goodbye to the biker, which felt nice. I was having a short pause when pedalling towards the Road 25. An elder man bypassed me on a bike and I went after him. When I reached him, I commented how nobody needs an upward slope like this ahead of us. – Yes, but from the opposite direction you will go downhill, was the optimistic answer. Now a westerly wind would have been valued for a biker, but there was nothing of a kind. Soon it started to rain, heavily, for perhaps half an hour. Just in time before another torrent I found a burger café to shelter from the rain and have a cup of coffee with a burger. Near Otalampi I turned to Katinhännäntie and again took a pause by the road. Everybody knows how this ’Katinhännäntie’ (’ Cat’s Tail Road’) got its name? No? Really? O.K., here is the explanation which I read when we lived in Otalampi: In the 1870’s a private Russian rail road company was building the railway between Hanko and Hyvinkää. One Saturday the rails were laid up to here and the company directors could drive to this building site with a locomotive. Of course now it was reason to celebrate the occasion in a thorough Slavic manner. On Monday morning the hilarious builders came to look at their railway. No locomotive, no rails, no nothing. Everything lies sunk in the swamp still today. The rails were laid on a firmer ground so that the railway curled around the swamp like a cat’s tail. Of course there is no truth at all in this story. Actually, the railway bend was built to bypass a high rock. – Why is the truth always so boring? At Otalampi I had an opportunity to rekindle memories of the neighbourhood where we lived in a house which we had built in the 1990’s and sold in 2005. There seemed to be plenty of new houses on the other side of Otalampi village. From Otalampi I drove back to the familiar camping site near the shore of Bodom. After a rainy day I did not put up a tent but rented a small cabin. In the evening I watched the fog raising from the damp soil. My bike journey ended here after some 510 km of pedalling. Next weekend we drove the rest of Seume’s route by car. I think it was quite appropriate, as also Seume used carriages instead of his own muscles in this part of Finland. Obviously Seume did sleep a night at Salo and another at Wista (in Paimio [Pemar]) before reaching Turku [Åbo] where he spent one or more days. From Turku he drove some 70 km to the village of Helsinki [Helsinge] in Taivassalo [Töfsala] which was the end point of the Old Post Road. From there he started to travel to Stockholm by boat. The album of pictures along Seume’s route (link below) covers also the end portion of his route in Finnish mainland.